iOS 8 is coming out next week and I’ve very interested in installing it on my iPad. Are there things I can do today to get ready for it? We’ll be offering a complete iOS 8 installation guide in the next few days, but I’m happy to reveal the steps you should take before the next version arrives. As you’d do before installing any new operating system, be sure that your data is backed up. You can do this either via iCloud or through iTunes on your computer. Let’s take a look at both options. You can initiate this in two ways. The first is to connect your iPad to your computer, launch iTunes, select the iPad in iTunes, click the Summary tab, and in the Backups area enable the iCloud option. The other is to choose to backup to iCloud from the iPad itself. You do this by going to Settings > iCloud > Storage & Backup and in the resulting screen enabling the iCloud Backup option. An alert appears informing you that your data will now be backed up to the cloud. Tap OK to allow that to happen. 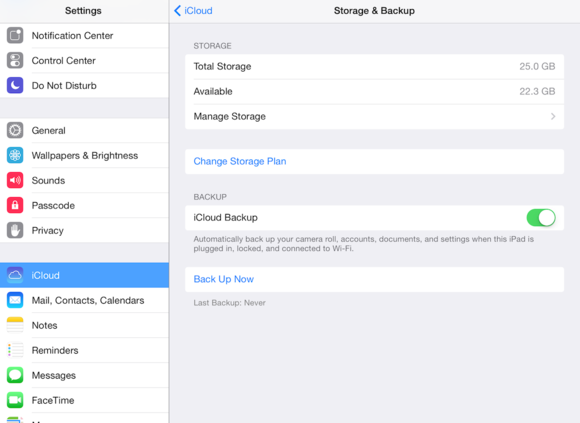 You'll find the option for backing up via iCloud within the iCloud/Storage & Backups setting. To do things the old fashioned way, launch iTunes on your Mac and string your device’s syncing cable between it and your iOS device. Select your iPad in iTunes, choose the Summary tab, and in the Backups area of the resulting window click on Back Up Now. If there are apps on your device that aren’t in your iTunes library a window will appear asking if you’d like to back them up. The choice is yours as you can always wirelessly re-download any apps you’re missing from the iTunes Store, but restoring them to your iPad will happen more quickly if they’re being copied from your computer rather than being downloaded over a slowish broadband connection. You can also back up your iOS device via iTunes on your Mac. iTunes will now set about backing up any apps on the device that aren’t in your iTunes library as well as other data the device contains. In either case, once you’ve installed iOS 8 you’ll restore from the backup you just made. This is something we’ll look at in greater detail when iOS 8 ships as well, but forewarned is forearmed. Be sure to have a copy of the latest version of iOS 7 compatible with your device. There are invariably cases where people wish they hadn’t upgraded—perhaps because an app they rely on hasn’t yet been updated for iOS 8 or, as it turns out, they hate change (or their older device runs more slowly with the new OS). If you act quickly, you can put things back the way they were. What I mean by quickly is this: Apple “signs” versions of iOS. This tells the device that the version you wish to use is okay to use with that device. While that version is signed, you can install it on your iOS device—even if it’s a version of the operating system that’s earlier than the one you just installed. However—and this is very important—Apple traditionally stops signing old versions of iOS just a day or two after releasing major updates (such as iOS 8). If you were to update to iOS 8 say, a week after it ships, you might find that you can’t go back to iOS 7. So, if you intend to be among the earliest adopters, it’s not a bad idea to have a copy of the iOS 7.1.2 .ipsw file at hand. This is where your devices' .ipsw files are stored. The Mac will delete this files under certain circumstances so you may not have a copy of the latest one. If not, launch your favorite web browser and search for "download ipsw". You’ll find a number of sites that offer links to the file you need. Just be sure to choose the correct one based on the device you’re using. When we discuss upgrading to iOS 8 in that future article I’ll also provide steps for rolling your device back to iOS 7 (at least for as long as you’re allowed).